Naturally neutron stars are not so easily formed, since collapsing the star, the gravitational energy is converted into heat quickly causing a large explosion. 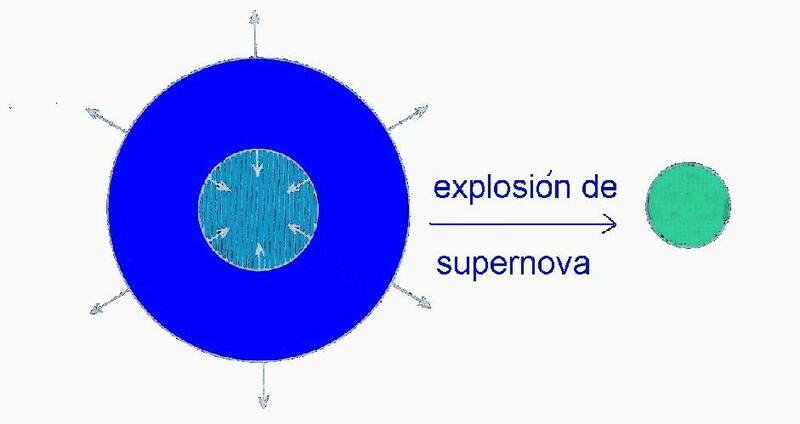 It would be a nova, or a Supernova expelling much of his material in the blast, so the gravitational pressure would decrease and the collapse could stop. This could allow to form objects of less density than the neutron stars, so-called “white dwarfs” in which the distance between the nuclei is decreased so that the electrons circulate free for all material (is the so-called degenerate matter), and is the speed of movement of those what prevents a further collapse. Therefore the density is very high but short of the neutron star. These degenerate electrons repel each other but not by electromagnetic repulsion but because by the pressure tries to occupy in the same orbital more electrons that can fit. Is the Fermi pressure of degenerate electrons acting when waves associated with electrons begin to overlap. But Chandrasekhar found that if the mass of the white dwarf is more than 1,44 solar masses, then due to the maximum speed limit of electrons (the speed of light) this Fermi pressure would not be sufficient and the star would collapse to a neutron star. It has been estimated that over 2,5 Suns of mass, a neutron star would collapse further merging their neutrons. It is also possible due to the Pauli exclusion principle by which repulsion of neutrons has a limit when the speed of vibration of the neutron reaches the speed of light. It is the TOV limit, of Tolman-Oppenheimer-Volkof, which is not clear which is, due to not yet known exact equation of state of extremely dense matter. Because there would be no known force to stop the collapse, this would continue until the star turn at one point creating a black hole. This timely volume would imply an infinite density, which is why it was rejected initially by the scientific community, but S. Hawking showed that this singularity was consistent with the theory of general relativity of Einstein. Once surpassed quantum degenerate neutron pressure, those could be merged into a point, but there may also be a pressure of degenerate quarks and a new limit not yet calculated.